Start your daily training in a simple situation with only one person talking in a low voice. Increase complexity slowly to avoid frustration. There is no hearing aid on the market that will allow you to follow a group discussions in a loud restaurant. But in this kind of environment it is possible to put your device in front of your partner and hear his voice using the 'Basic Amplifier' module of swissHear. We recommend medium to high quality stereo headphones without a microphone. They have three contact rings on the plug. Headsets with microphone (5 contact rings on the plug) make your voice sound unnaturally loud and don't deliver stereo sound. On the other hand, these headsets may be great if you just want to listen to something and your phone is in a pocket (conference, theater, concert…). swissHear relies on the sound system of your phone and that typically leads to a small lagging of the signal (latency). New phones from our list will have the smallest lag. 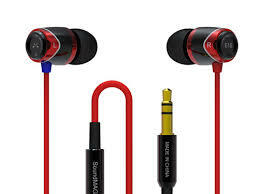 In ear phones can be helpful because they block the ear and minimize the echo effect. Some people find the perception that sound seems to originate in their head disturbing and prefer open headphones. They can live with the small echo. You will have to find the kind of headphones that you feel comfortable with. A phone cord extension will allow you to place your device in front of a speaker sitting farther away. You can talk to him as if he were sitting right next to you and talking into your ear. This is impossible with any in ear hearing aid. IMPORTANT: currently swissHear does not support Bluetooth headphones and headsets. swissHear works on smartphones with Android version 5 or higher. Low latency (low lag) stereo audio is possible with most high end smartphones starting from Android 6. Please let us know any results achieved with your devices. Plug in simple earphones. Headsets with a microphone will result in poor sound quality and won’t deliver a stereo signal. Medium priced media headphones from a super market will do. Use Basic Amplifier for loud environments, BioAid for conversations in small Groups. Switch between your modules by tapping on the arrow of the profile selector above the volume control. Turn on swissHear using the button in the middle of the volume control. If no earphones are detected this button will be disabled. Control the volume with the big wheel by spinning the control with your finger. Android may want you to acknowledge a warning that the sound level will reach a harmful level for the healthy ear. While you’re speaking, mute your voice with the red suppression button at the bottom of the screen. Modify the settings of a module by tapping on its name over the volume control while swissHear is running. If you have an over-amplified signal you may have to reduce the gain setting. If you can't seem to get enough volume, you can increase the gain. If the signal is not stereo, the quality seems bad or the latency of the signal is large then you may nead to tweak your device. Click here to find detailed information on setting up your device. The BioAid algorithm has been developed to compensate hearing problems. You can open the configuration page by tapping on the "BioAid" text while swissHear is running. You can choose between the settings for common hearing disorders. Most users will find their correct setting easily. Check out the visual explanation here. Please create a situation where you have different voices in the background. Listening to a soap will do fine if you set the volume of your TV to a level that you just begin to have difficulties understanding what is being said. Click here to find detailed information on setting up BioAid. IMPORTANT: It is not possible to use a cheap radio receiver or a small TV set to find your settings. The sound spectrum is constricted by the tiny speakers and you will not get realistic results.